Swirl diffusers are designed to create a rotary swirling motion to the supply air discharge, which rapidly induces the room air to quickly decrease the velocity and temperature difference of the supply air. Within the range of swirl diffusers are fixed air pattern, adjustable air pattern and variable air pattern swirl diffusers. The fixed air pattern swirl diffusers have a horizontal discharge and are suitable for minimum mounting heights of 2.6 meters to a maximum of 4 meters at a temperature difference of ±10°K. 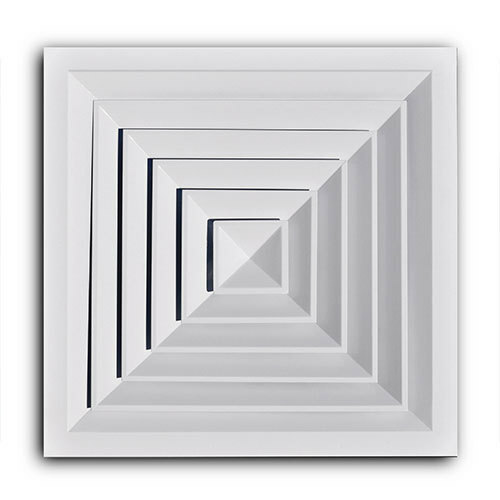 Adjustable air pattern diffusers are used for the same mounting heights and temperature differences but can be adjusted for horizontal or vertical discharge. Whilst the variable air pattern swirl diffusers have either a horizontal or vertical discharge and are suitable for mounting heights up to 15 meters at a temperature difference of ± 10°K. We have attained horizons in manufacturing and supplying of Metal Products. Our experience is the reason behind of our rich domain knowledge, which assists us in catering to the needs of demands of diversified industries. We deal in a wide assortment of Metal Products, including Air Handling Unit, HVAC. The quality measures followed by us have accredited us with the proud ISO 9001-2008 certification. Designed and fabricated by skilled professionals, our range is well-known in the domestic market. We have established a robust infrastructure base that is based in vast geographical area. Equipped with technologically advanced machinery and equipment, our infrastructure base is loaded with ultramodern testing techniques as well. Managed and operated by expert professionals, our unit is the core reason that assists us in meeting requirements of the clients. The success of our organization rely on the hard work and dedication of our team members, who have enabled us to garner a rich network base in the countrywide markets. Further, our business network is well-connected with the transportation modes enabling us to make efficient and time bound deliveries at the clients ends.